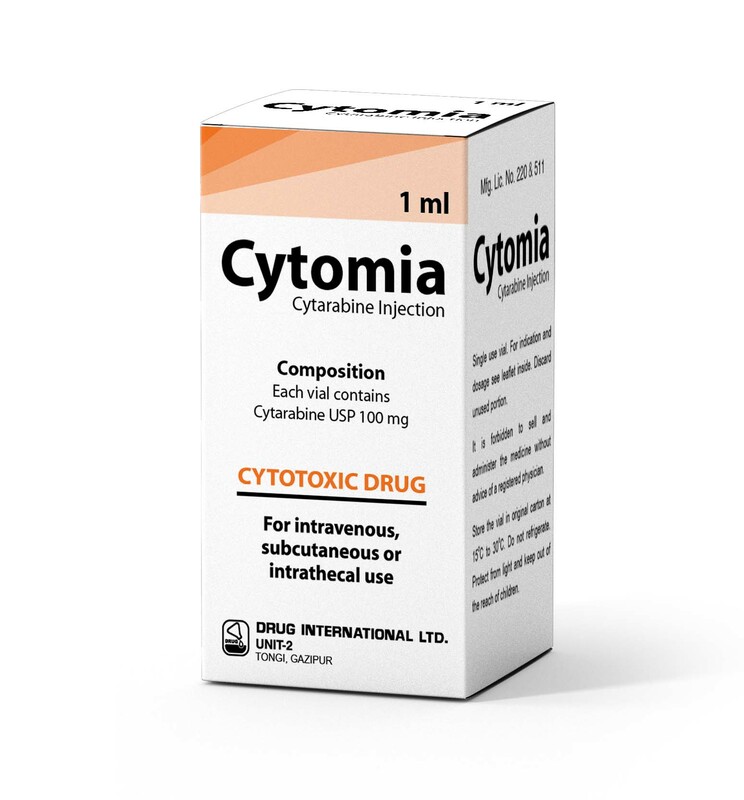 COMPOSITION: Cytomia Injection: Each vial contains Cytarabine USP 100 mg (100 mg / 1 ml). DOSAGE AND ADMINISIRATION Being orally inactive, cytarabine is administered by a variety of parenteral routes: subcutaneously, intravenously either as a bolus "push" or as a continuous infusion, or intrathecally. Thrombophlebitis has occurred at the site of drug injection or infusion in some patients. Pain and inﬂammation at subcutaneous injection sites are rare. Subcutaneous injection sites should be rotated around the areas of body fat: the abdomen, thighs and ﬂank region. The drug is generally well tolerated in most instances. Higher total doses can be better tolerated when administered by rapid IV injection as compared to slow infusion. Such a phenomenon can be explained by the rapid inactivation of the drug and the brief exposure of susceptible normal neoplastic cells to signiﬁcant levels after rapid injection. Normal and neoplastic cells appear to respond in almost parallel manner to these two modes of administration and no distind advantage has been established for either. Clinical experience to date indicates that success with cytarabine therapy depends more on adeptness in modifying day-to-day dosage to obtain maximum leukaemic cell killed with tolerable toxicity, then on the fundamental treatment protocol selected at the start of therapy.Toxicity necessitating dosage modiﬁcation almost always occurs. Dosage of cytarabine must be based on the clinical and haematological response and tolerance of the patient so as to obtain optimum therapeutic results with minimum adverse effects. Even though higher total doses of cytarabine can be given by IV injection compared to continuous IV infusion with similar haematologic toxicity, the most effective dosage schedule and method of administration are yet to be established. Moreover, cytarabine is often used in combination with other cytotoxic drugs, thereby necessitating dose modiﬁcation of cytarabine and other chemotherapeutic agents, and the method as well as the sequence of administration. Following is an outline of dosage schedules for cytarabine therapy as reported in the literature. Use in Pregnancy: Cytarabine is suspected to have caused or may be expected to cause an increased incidence of human fetal malformations or irreversible damages. It may also have adverse pharmacological effects. Cytarabine has been shown to be teratogenic in some animal species and should not be used during pregnancy, especially during the ﬁrst trimester, not in women likely to become pregnant.